Hello! My name is Robin Ulbredtch. 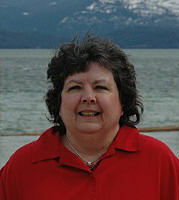 I live in Sandpoint, Idaho, with my husband, Steve. I have lived in and loved north Idaho my whole life. Though I have traveled several places abroad, if God wills it, I hope to finish out my years in this beautiful place! Before the foundations of the world, God knew me and fashioned my days. He knit me together in my mother�s womb. Then, with much difficulty, my mother gave birth to me. My natural life and testimony began with my birth in December of 1956 in the small rural hospital in Bonners Ferry, Idaho. My parents, the Millers, who were married just over a year, made our home in the small village of Moyie Springs which is about 10 miles northeast of Bonners Ferry. At that time Moyie Springs lay nestled among evergreen trees. In places it overlooked the Moyie River which winds its way through the rocky valley of the rugged Moyie Canyon. As I remember, the village consisted of a cafe with a bar in the back, a lumber mill, a small community church, a U. S. Post Office and a small store with an adjoining gas station. Several families, mostly of lumberjacks, lived in the small village. Moyie Springs was my home until my fourth-grade year of school. During my preschool years hours were spent playing in the sandbox with my two boy cousins, playing with Barbie dolls with my girl friends, and whenever possible attending Vacation Bible Schools with my friends. During my fourth-grade year our family moved to Bonners Ferry. That year my teacher, Mr. Thomas, opened my eyes to the wonderful world of creative arts. I was fascinated with his drawings on the chalk board and the stories he told our class. Mr. Thomas inspired me to learn to draw and participate, in a variety of arts and crafts. I found out I had a passion for creative arts that still continues to this day! Also, during that year I began attending Trinity Lutheran Church. My new home was within walking distance of the church so I frequently made the trip to attend services and special events. It was there that I fell in love with God�s word and accepted Jesus Christ as my personal Lord and Savior (though I didn�t understand what it all meant). I spent my elementary school years attending Bonners Ferry schools, participating in band and Girl Scouts, and teaching myself how to do arts and crafts from every resource I could get. After eighth-grade graduation, I looked forward to high school. I enjoyed school, except for math! I began High School in Bonners Ferry but in the middle of my sophomore year our family moved because the place my father worked promoted and transferred him to Lewiston, Idaho. I continued my education at Lewiston Senior High school until the summer after my junior year. During this time I met the man who would later become my first husband, and the father of our two sons. The summer following my junior year my father got a second transfer from work, and we moved to Sandpoint so we could help with my ailing grandparents. As a result, I completed high school and graduated from Sandpoint High in 1975. After high school I went back to Lewiston and stayed with some of my parents� friends. I began working as a statistical typist and work-study student at Lewis-Clark State College. I worked part time, and took both academic and vocational business classes. In June of 1976, as an ignorant teenager, I married my first husband. I knew nothing about alcoholism or that my husband�s weekend beer parties 'with the boys' would turn into a full-blown addiction. I had no idea of the years of abuse and terror I would endure because of my poor choice. I loved my husband but that love was not enough to solve our problems, and God would not force my husband to accept Him. In October of 1978 my husband and I decided to move to Sandpoint so he could train to become an office machine repairman in my parents� office supply business. From 1978 to 1986 we moved between Sandpoint and Coeur d�Alene, helping my parents with their business. During this time, we had two wonderful sons! In July of 1986, after many years of abuse, I came to the realization that I had to get the boys and myself out of that situation if we were to have any chance of a healthy and happy life. One morning I had my sister come and help me move our belongings into a van and car, and we moved from Coeur d�Alene back to Sandpoint to live with my parents and rebuild our lives. By October of that year my divorce was finalized and I began working for my parents in their Sandpoint business. In January of 1987 the boys and I moved into a two-bedroom apartment to begin our new life. With help from God, my family, and child support we were able to upgrade to a three-bedroom apartment, where we lived for ten years. The boys attended Sandpoint schools and also participated in community softball and soccer. One day, while I was delivering office supplies to First Christian Church, I met a young Pastor named Frank, who was in charge of the music ministry and youth group. He seemed so full of passion for Jesus and joy that he inspired me to begin serving God again. I began asking him about that church�s beliefs. I also told him briefly about my family situation, and that I wanted to find a church that we could attend. I found out that our beliefs were similar and the church was only a couple of blocks from our apartment. So the next Sunday my family began regularly attending that church. At First Christian Church I got born again and rededicated my life to Jesus Christ. The boys attended Sunday school. I participated in choir and orchestra and helped in children�s ministry, working in camps, children�s church and vacation Bible schools. Eventually I led children�s church and also a singles Bible study. The singles group went for about a year before it eventually dissolved as the singles met, paired off and married each other. In 1990 my parents sold their office supply business and retired. I continued working for the owners for a few years but eventually found out that we did not agree on many things, especially things regarding my Christian faith. The new owners were destroying the business right before my eyes! Finally, in about 1994, the new manager, a former employee that my father had let go, gave me my pink slip. Since that time I�ve worked several jobs including working in a book store, being a Crew Trainer at McDonald�s and teaching living skills to developmentally-challenged adults. Not long after I was let go from my job in the office supply store, the Lord began calling me to write. He ministered to me as I sat at my computer desk working on some desktop publishing projects. As a result, I realized I didn�t know anything about being a professional writer so I enrolled in the Journalism program at North Idaho College. As I attended classes, God worked many miracles to help me through school, and with my writing. This reassured me this was His will for my life! Since then, there have been many prophecies over my life and many confirmations. I know God wants me to write Bible study books for His glory! In 1991 I met my present husband, Steve, who lived in the same apartment complex as the boys and I. Both Steve and I were determined to never get married again because of the hurt of past relationships. As we became friends, Steve kept coming over to visit several nights a week. He also asked for help on his computer so I would occasionally go over to his place and help him. We became friends and ministered to one another with God�s word. After about a month I knew God had set me up, and I was falling in love again! After three years, and much discussion and prayer, Steve and I decided to get married. In April of 1994 we were married at First Christian Church. During our discussions Steve began sharing about the Baptism of the Holy Spirit and speaking in tongues with me. This was something that I had been taught was not for this time period. In fact, some of the churches I�d been in thought it was heresy. I struggled with it a lot until God finally showed me it was from Him and it was real! During this time God was showing me truth and leading me to Sandpoint Christian Center, the church Steve attended. After Steve and I were married, the boys and I changed churches. They are now grown and have families of their own but Steve and I have been at Sandpoint Christian Center since that time. At Sandpoint Christian Center I've taught Sunday school for preschool through sixth grade, started a children's church, helped with children's and teen camps, helped in the church office, taught a women's Bible study and a home Bible study. A few years after Steve and I were married, my parents helped us with a down payment so we could purchase the home where we now live. In May of 2002, I completed an A. S. and an A. A. Degree in Journalism from North Idaho College. I also took several art and computer classes, and worked as a work-study student in Molstead Computer Lab, helping other students with simple computer problems. I went on to complete a B. S. Degree in Education from Liberty University Online, graduating in 2012. I love teaching, writing teaching materials and other things as well. God has blessed us mightily! He has done much healing in our lives, and we are quickly approaching our 24th wedding anniversary in April of 2018. Though we have difficult times like everyone else, we are truly blessed! God has blessed me with the opportunity to write for His glory. Presently I have self-published two books and have plans for more in the future. My husband also helps me with some of the work. He also loves--and does an awesome job--of taking photographs. Steve also has more knowledge about scripture so he can help me in that respect. This is just another testimony that God knows the right person for each one of us. May God bless you as you continue your journey with Him! I'm happy to announce that my second book was successfully self-published through www.westbowpress.com It's called Behold Our Awesome God! It's a 13-week Bible study on the character of God and how He intervenes in the lives of His children. I'm excited about teaching others about our awesome God, and how He can heal broken hearts and lives. I know He can do this because He's done it for me. He intervened and stopped me from the dreadful mistake of trying to commit suicide many years ago. Since then God has shown me how many blessings I would have missed out on if I had succeeded, and He has brought much healing into my broken heart and life. Since God has done this for me, I know He can do it for others too. So get a copy of this new teaching and Behold Our Awesome God! Graduation from North Idaho College in 2002 with A.A. and A.S. degrees in Journalism. Graduation from Liberty University in 2012 with a B. S. in Education. Teaching God's word and working in various forms of ministry for over 30 years. I've worked in children's ministry, women's Bible studies, singles ministry, and the church office. Presently, I'm doing a weekly Home Group Bible Study and I'm discipling others with God's word. With the help of the staff at http://www.westbowpress.com I self-published my first book Heart to heart: A Discipleship and Mentoring Plan. It's an informational guidebook to help others that want to learn about leading small group Bible studies. Completing and self-publishing my second book, a 13-week Bible Study on the attributes of God, and how He intervenes to help His children. Thanks to www.westbowpress.com I have a beautiful cover and a great-looking book for those who want to study about some basic attributes of God.